Is this gorgeous or what?! I am so pleased with the cover art for my book — squee! When Storm told me they were going to be putting out this new edition of Pelzmantel, she asked if I had any preference for the cover artist. I immediately said Ruby, please! Ruby does the covers for most of Storm’s own books and has a real love for fairytales. I knew she would be perfect. First, I love the colors. Somehow the orange tones of the fox match so well with the midnight purple sky. The image captures the sense of magic and I love how she’s worked the spinning tokens in, the spindle and bobbin. It captures the sense of mystery as well — the hidden princess who must mask her identity and of course, the clever fox, too. Wow — just wow!! (wait, isn’t that what you said, Mildred?). Thank you, Ruby — thank you so very much! Pelzmantel: A Medieval Tale coming from Immanion Press this June. It looks like we will have posters of Ruby’s illustration and maybe some other items, too, at the Immanion Press store. Thanks, Isabel! I am so excited about this. 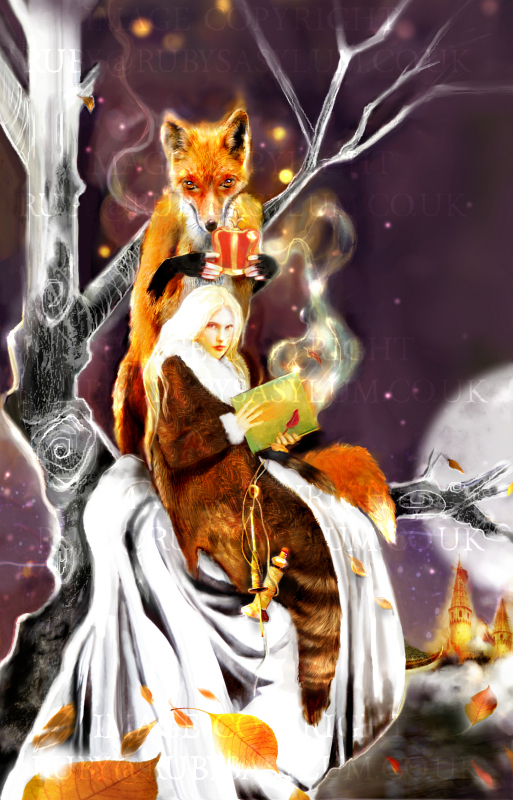 Very nice, though I thought the fox was hoisting a brew at first glance. (It's clearly a crown in larger view.) Well done. Hoisting a brew would not be bad, either! Mmmm, beer. Glad you like. Okay, I thought the fox had a mug full of something too! It's an absolutely gorgeous cover, Kate!!! Absolutely gorgeous!! !I am so looking forward to reading this. All the colors of faerie itself have cast their glamour upon me. Thanks for sharing. LOL — yeah, Todd! Take a vacation already!Jack, thank you so much.I'm reminded by another blogger about the importance of library copies. If you local (or college) library orders a copy, you can really share the wealth (so to speak). NB: I've changed the picture to the watermark version that Ruby sent me, the better to maintain her ownership over the image. Naughty web people borrow without crediting as we know. And again I say, what a wonder Ruby is! Beautiful cover – very dynamic composition with all the swirling, spiraling elements. Colors are very atmospheric, too. As someone who's done my own cover illustrations, I admit I'm a tad jealous. Thanks, Julie! LOL, if I had to do my own covers, I'd have nothing but stick figures (as my students know well and have laughed at). At least you're an artist.